recently i watched a movie called “taste of happiness” that had a shanghai chef in japan who cooked all these dishes in this huge wok. my mom also cooks with a wok and every time i go home to eat, i marvel at how well scrambled eggs come out. other things seem to cook differently in a wok too – green veggies always come out more colorful and less wilted, and meat gets cooked thoroughly and tenderly without ever sticking to the side. so for a few weeks i was raving about how awesome a wok is. then, christine bought me a wok as a present, and last night i broke it in and made my first meal in the wok. i also used a new wok scoop that i bought in chinatown, and a butcher’s knife christine bought for me. the butcher’s knife is great – it is heavy and sharp and cuts vegetables completely differently than western chef’s knives. the wok scoop, surprisingly, is all you’d need to cook anything in the wok. you can stir the ingredients being cooked, spoon in broth or spoon out soup, you can use the edge to cut meat or veggies into smaller chunks in the wok, use it to serve single servings of rice, you can even scramble eggs using the scoop. i made cucumber with scrambled eggs (i would have done the traditional tomato and eggs but my haymarket cucumbers were looking a bit overripe) and a large batch of garlic green beans. i made half of it with marinated tofu leftover from our barbeque last night, and another half with beef (from leftover hamburger). so christine, here’s to cooking together to procrastinating together. scramble two eggs in a bowl. sprinkle with salt. heat wok with a bit of oil. 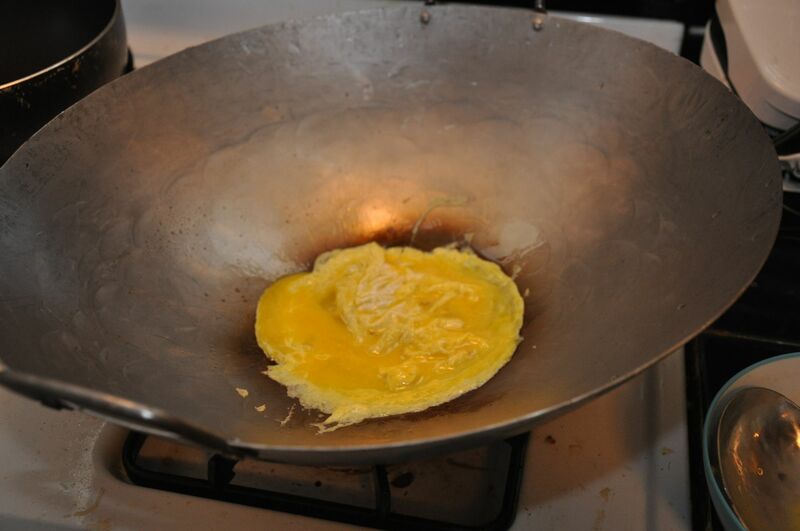 before oil gets hot and starts smoking, pour the egg into the wok. occasionally stir until egg starts to firm, then scoop the scrambled egg back into the bowl. peel and slice cucumber at an angle into elongated oval slices. heat oil in wok. put a bit more oil so that the cucumber doesnt become burned or dry, and will come out with more color. 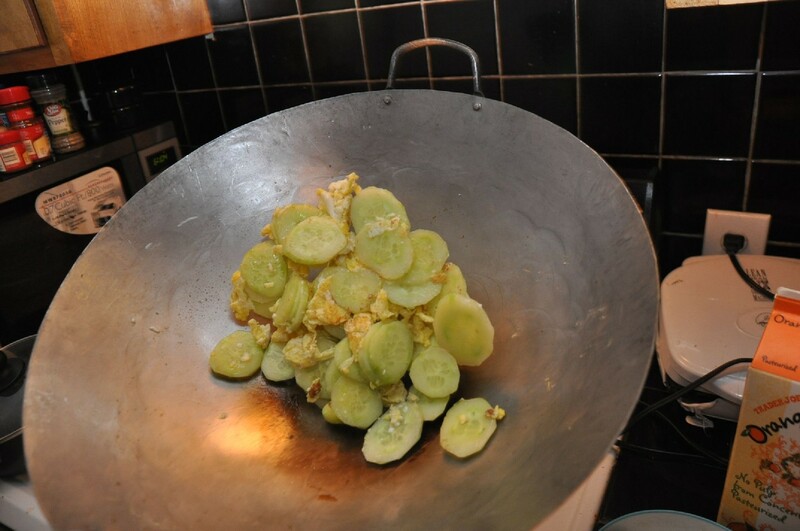 stir-fry cucumbers for two minutes. add the eggs back in, stir fry and add salt to taste. slice extra firm tofu into 1/4 inch slices. prepare a marinade of soy sauce, sesame oil, and furikake, and soak the tofu in the marinade. be sure to flip the tofu once so both sides get covered by furikake. after marinating, cut the tofu into bite size squares. take 80% lean hamburger (1/4 to 1/2 lbs, about the size of 1 burger patty). hand mix garlic powder, adobo powder, salt, pepper, and cumin. 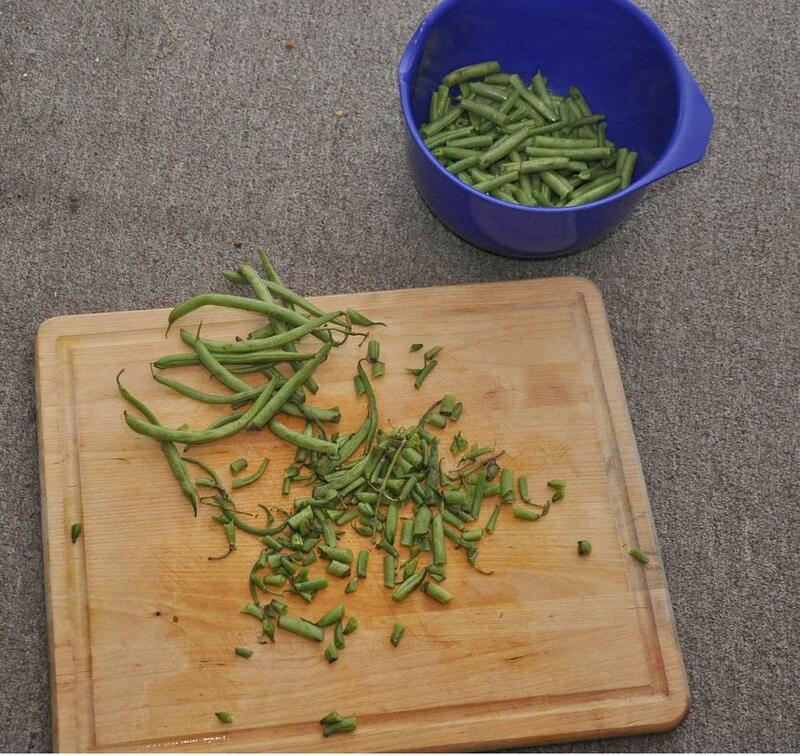 wash and prepare the green beans by pinching off both ends, then breaking the beans into 1 to 2 inch long segments. peel and dice one clove of garlic into larger, rough slices. 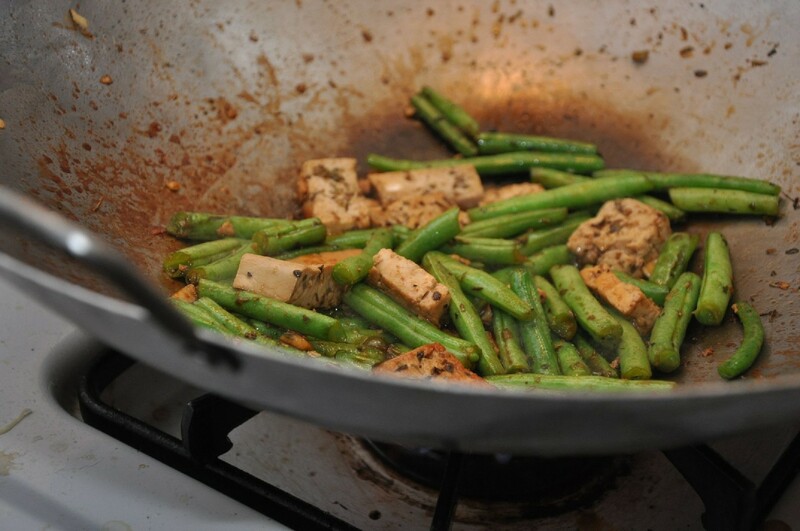 heat oil in wok, and toss in the tofu or the beef. if using beef, break the meat into small chunks as it cooks. remove the tofu when the sides barely start to brown, and the beef when it is almost thoroughly cooked. heat some oil and toss in the garlic. stir for a few seconds for the garlic to start flavoring the oil, then toss in the green beans. stir fry the green beans, making sure that everythings gets a slight coat of oil and starts to get a bit tender. 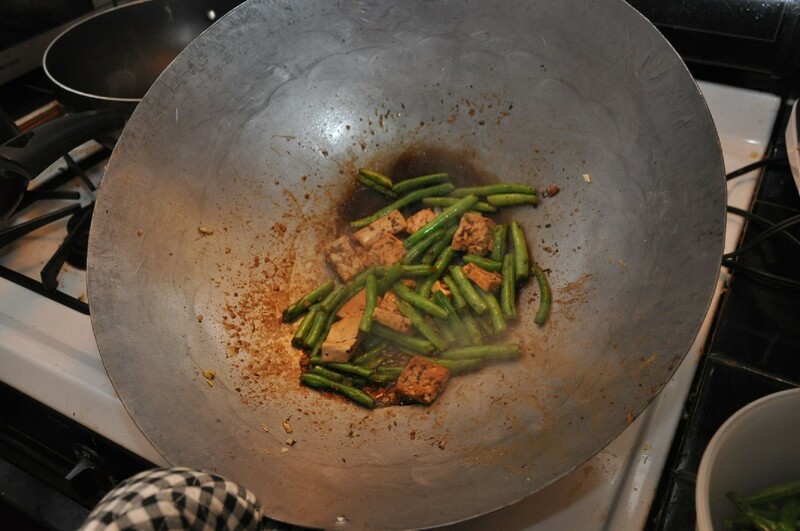 toss the tofu or beef back into the wok and stir fry together, adding salt and soy sauce to taste. remove when the green beans are tender but still slightly crunchy, and still have a bright green color to them. cooking time: 15 minutes to prepare green beans and cucumber while rice is cooking, 15 minutes to stir fry. ways to prolong procrastination: cook a large batch of food. the wok is huge.